Au Fil Des Mois [C7260] - $10.00 : Yarn Tree, Your wholesale source for cross stitch supplies. Cross stitch pattern from Jardin Prive. 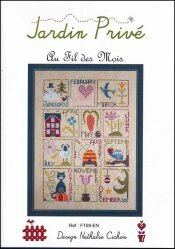 "Au Fil des Mois," means over the month. Each month has a different design to go along with it. January features a snowman. February features a hand holding a heart. The continuing months have their own design to go along with the month. Stitch count is 135w x 194h. Stitched on #7509 Zweigart Aida 20ct. Country Mocha. This was an exclusive design for the 2018 Nashville Needlework Market.